Fangirl, I like face masks. I like the idea of spreading weird goop on my face and having it make me feel like my skin is softer or cleaner, or just about anything. It’s a neat idea. I found One’s product in my local Hannaford for $2.49, so I figured I would give it a shot. I’m going to warn you; there are some goofy selfies in here. Be prepared. What really drew me to this product, was how stinking adorable the packaging is. It shows a happy lady with a mask on her face. On the back, it repeatedly compliment you, which I am all about. A big thing with beauty products is claiming that women need this product to be pretty or happy. Not this one. It calls the reader “pretty,” “gorgeous,” and more, which was refreshing on it’s own. Another neat thing about the packaging; it’s recyclable with tin cans. So instead of just trashing it, you can put it in your recylcing bin. It’s nice to know that they’re concerned with their carbon footprint. It’s also cruelty free, which is a huge bonus. Unlike all of the masks I’ve used in the past, this mask is kind of a wet towel with cut outs for eyes, nose, and mouth. It made for some extremely goofy progress pictures (which I already warned you about), but was neat to experience. It smelled fantastic, Fangirls. When I took it out of the package, I was hit with a relaxing wave of scent. It was strong, but definitely not overwhelming. I plastered it on my face, and stepped into a bath to relax further. 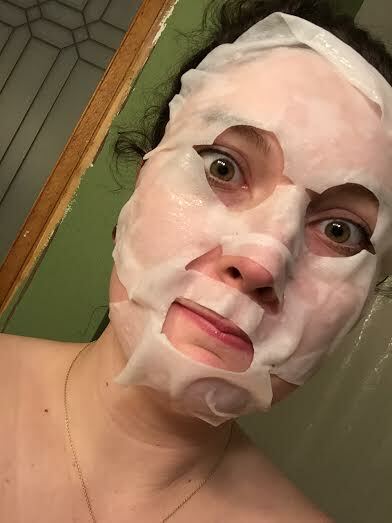 The mask’s packaging suggests 15 to 20 minutes, but I left it on for almost two hours. I was expecting it to harden, in the way that other masks I’ve used did. 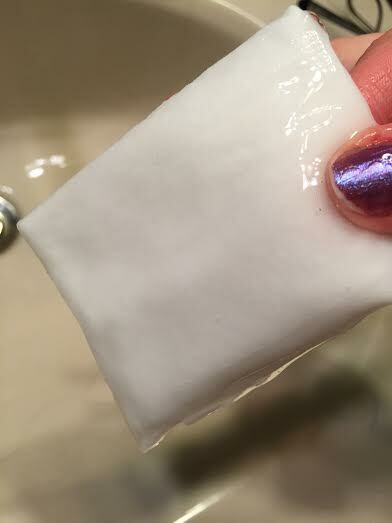 I thought it would feel a bit like the Biore pore strips; how they start soft and harden, but it didn’t. Almost two hours later, and I’ve decided that my new name is Latherface. As my bath cooled and I realized I was about done, I pulled the mask from my face and rinsed my face. It left a bit of residue, from the wetness of the mask, but some cool water on a washcloth took care of it, no problem. After that, I toweled off and hopped in bed. 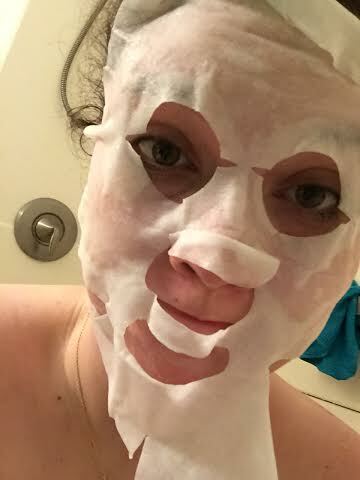 This mask definitely left me feeling relaxed and ready for bed. I was a bit confused by the towel like appearance, but it’s something I plan on using again, and I wholeheartedly recommend it to all of you Fangirls out there. 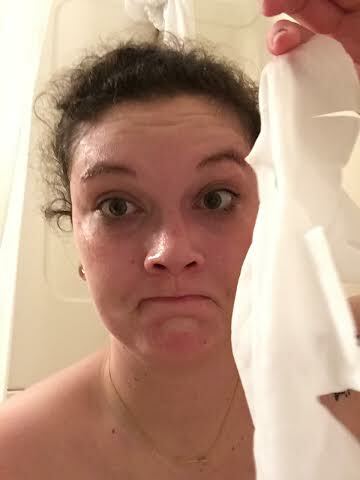 It’s a different method than I’m used to, but I loved every minute of it (plus cruelty free & recycling are great things to look for). So check it out, Fangirls! 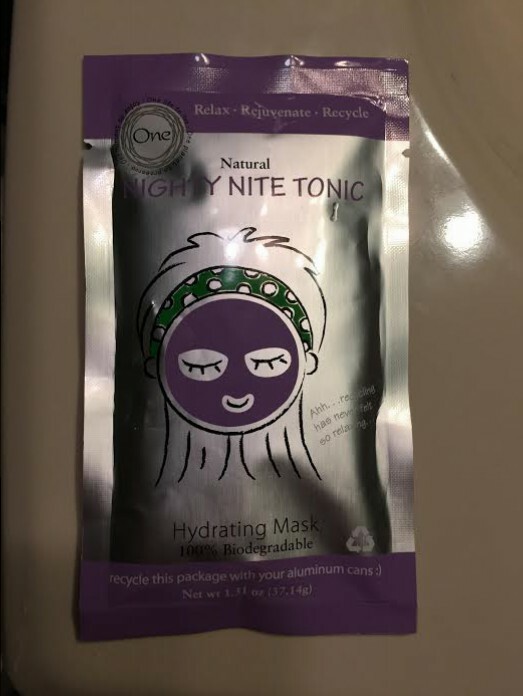 I’m sure you’ll adore One’s Nighty Nite Hydrating Mask as much as I did!